‘Tower Skin’, LAVA’s speculative transformation of the UTS tower in Sydney Australia, has won a ZEROprize Re-Skinning Award. The awards are given by Zerofootprint, a leading organization in the global fight against climate change. The United Nations Habitat is a partner of the awards. The winners were announced last night in Rio de Janeiro as part of the U.N. World Urban Forum 5, Brazil, March 22-26, 2010. The ZEROprize Re-Skinning Awards are intended to ‘stimulate market-disrupting improvements in the design and development of retrofitting and re-skinning technologies that enhance the energy efficiency and liveability of older buildings’. ‘Tower Skin’ offers a unique opportunity to transform the identity, sustainability and interior comfort of a once state-of-the-art building and can easily be applied to 1960s icons across the world. 1960s icons could receive a muchneeded facelift thanks to an innovative plan called ‘reskinning’. Multinational architectural practice, Laboratory for Visionary Architecture (LAVA), has developed a simple, cost effective, easily constructed skin that promises to transform these tired icons into sustainable and stunning buildings. “A speculative project, ‘Tower Skin’, for the University of Technology [UTS] Broadway Tower in Sydney, Australia offers a unique opportunity to transform the identity, sustainability and interior comfort of the once state-of-the-art building,” said Chris Bosse, Australian director of LAVA. It can easily be applied to 1960s icons across the world. Tower Skin is a transparent cocoon that acts as a high performance ‘micro climate’. It generates energy with photo-voltaic cells, collects rain water, improves day lighting and uses available convective energy to power the towers’ ventilation requirements. The Tower is wrapped with three-dimensional lightweight, high performance composite mesh textile. Surface tension allows the membrane to freely stretch around walls and roof elements achieving maximum visual impact with minimal material effort. As day turns to night, Tower Skin becomes a dynamic sculpture on Sydney’s skyline, an intelligent media surface, communicating information such as performances and campus events in real time. The proposal integrates principles of architecture, fashion, media and communication design into a new hybrid solution. “A re-skinned UTS Tower could be an example of sustainability, innovation, cutting edge design and creative education, without demolishing and rebuilding the 1960s icon,” added Bosse. When it was built the Broadway tower was cutting edge, with latest building technologies and principles that have partially become obsolete. 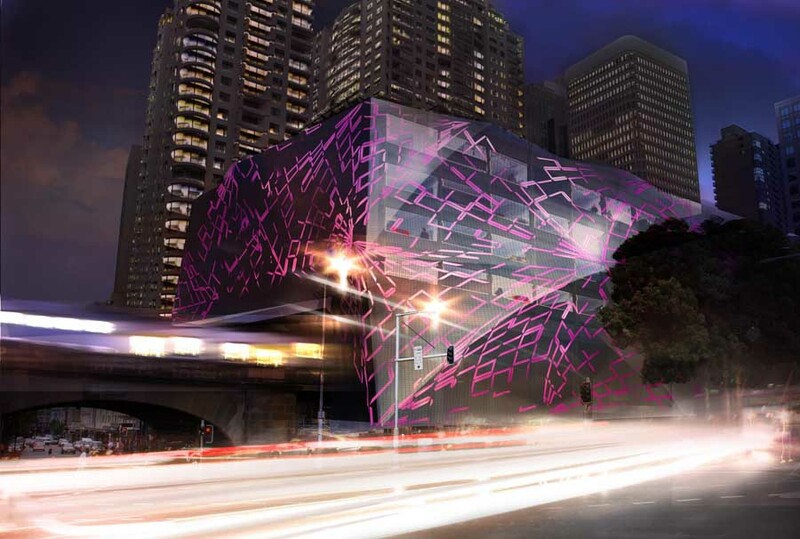 LAVA has also proposed a transformation for a much maligned car park in Sydney’s CBD. The proposals continue LAVA’s ongoing research for sustainable public architecture by combining lightweight contemporary materials with the latest digital fabrication technologies.
. Existing solar energy used to off set energy requirements.
. Water collected from the atmosphere.
. Energy peaks removed via ‘microclimate’ in tower envelope.
. Natural convection draws conditioned air through existing rooms, vent to the exterior to generate energy.
. Localized user control of air and temperature. and cutting edge digital workflow mean cost-effective fabrication and installation time.
. A solar powered light and media strategy embedded into the fabric. Plans for Tower Skin are on display at STATE. RESPOND. Exploring sustainable design, Object Gallery, Sydney from 6 February – 28 March 2010.